Ali Fahmi has a Bachelor’s degree in Industrial Engineering and a Master’s in Management Engineering. 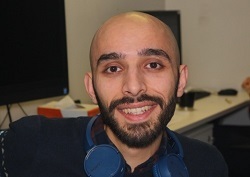 He is now studying a PhD in Computer Science at Queen Mary and is a member of the Risk and Information Management Research Group. Why did you choose to study for a PhD at Queen Mary? A couple of years ago, I came across an alumnus of the School of Electronic Engineering and Computer Science (EECS) at Queen Mary presenting his PhD thesis. I searched EECS webpages and discovered many professional research groups and sophisticated researchers with high cited publications, which led me to find my current supervisor and finally apply for PhD. I’m doing a PhD in Computer Science and I am working on an intelligent system for diagnosis and remote monitoring and control of chronic diseases using graphical probabilistic models called Bayesian networks. We collaborate with doctors and personally I’m paired to a medical research fellow to realize this interdisciplinary work. I’m a member of the Risk and Information Management (RIM) group at EECS. My supervisors professionally support me through one-to-one and group meetings on a weekly basis. Other members of our group including academics and PhD students are actually helpful, supportive, and friendly. What are the best things about the programme? As a member of a cross-school project and working with researchers from different backgrounds, I am improving both my scientific abilities and cooperation skills. How would you describe Queen Mary in terms of teaching excellence, innovation, academic and study facilities? The academics of Queen Mary are literally excellent in teaching and doing research, and the university supplies all study facilities and up-to-date education systems. The main campus is located next to the Regent’s Canal with beautiful views, where people gather together and enjoy their time. What’s the most interesting thing you’ve done on your programme so far? Working on a real world problems along with computer scientists, medics and volunteer patients has made me feel confident that science can actually make life easier for people. Alongside my study, I attend various workshops presented by Queen Mary to improve our skills of interaction, communication, public engagement and so on. How is studying for your PhD at Queen Mary preparing you for your future? The opportunity of studying PhD at Queen Mary is not only providing me with research skills, but also is giving me the chance to expand my professional network, which will support my future career.